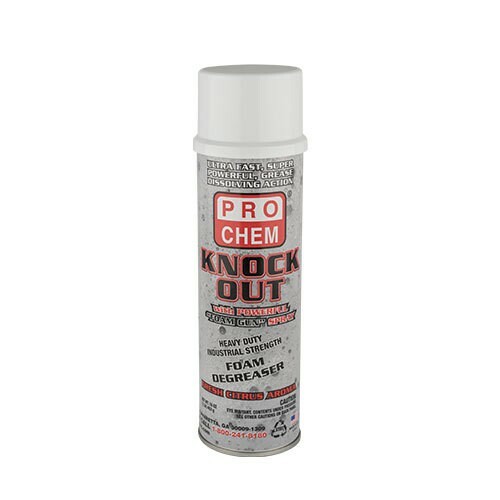 KNOCK OUT | Pro Chem, Inc. This heavy duty machinery degreaser is the perfect foam cleaner for the cleaning of dirty, greasy, oily machinery, road equipment, air conditioning coils, exhaust vents, tools, concrete, parts and much more. KNOCK OUT sprays out as an engulfing, heavy-duty foam that clings to surfaces to provide extended degreasing contact time. Contains super-powerful, water-soluble, grease-dissolving agents and detergents for instant degreasing action. The self-indicating cleaning action foam quickly breaks down grease and grime and becomes discolored; indicating contents are ready to be flushed clean. Leaves a pleasant, clean citrus fragrance. SHAKE WELL BEFORE USING. For best results, spray directly onto greasy surfaces. Look for self-indicating foam to become discolored, then flush with water stream. For difficult to remove contaminants, allow foam to remain on surface for several minutes before flushing. Repeat application as needed. A stiff bristled brush may be useful for loosening stubborn deposits.